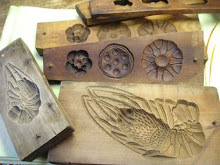 Wagashi, traditional Japanese confectionery, has been a part of my life since childhood. My mother neither made it nor purchased it, but guests to our home often brought gift boxes of wagashi, and of course, it was often served along with tea when I visited the homes of my friends or neighbors. In those days western-style desserts and British teas were rarer, more expensive, more "classy," and therefore more valued by shallow youths such as myself. So it wasn't until I went to the US for college, in a mid-western town with no Japanese food sources to speak of, that I developed a strong craving for wagashi. This craving grew all the stronger because I could not readily satisfy it. This was the start of my adventures in making credible wagashi with easy-to-locate ingredients. I even remember the very first wagashi I made from a simple recipe I found in the Sunset Oriental Cook Book (c. 1970) published by Sunset Magazine. I will post that recipe later. For now, suffice it to say that the experience was the start of a whole new respect and admiration for the food craft of wagashi. Some years ago, I got it into my head to pursue certification as a wagashi shokunin (wagashi artisan), but it never happened. It turned out to be one-too-many commitments in an already over-committed life, and I settled for dabbling in it as a hobby. 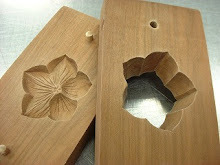 If you are a fan of wagashi, I hope you visit this site often. 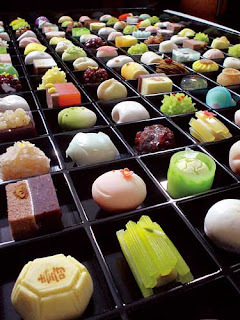 Join me as I explore the world of wagashi.